Last week I was tested on deep anatomy of the skin, skin health, aging, disorders, and prevention of skin problems in the salon. I passed with 100%. A good instructor (Miss Bethany) really makes a world of difference when it comes to theory and testing. The material just continues to be more difficult. I'm not working toward my nursing degree. Meanwhile the practical ( salon floor) becomes second nature. Lately my right hand has been so sore. I know I've used my muscles before but wow! 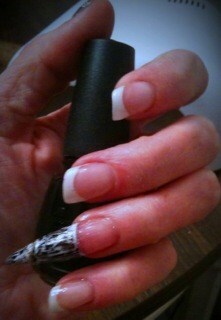 I have my regular clients coming into the salon more frequently for even more services and products. It feels good building clientele — no trophy needed, the smile on their faces and the booking of their next appointment are enough for me. Why do a majority of men feel they don't need a manicure or pedicure? This boggles my mind. I think the men out there need to realize just what they are missing. I plan to walk through factories and solicit my services at a discount just to let the men know what they’re missing. Well, that is my plan once I get to take and pass my state board exam. I can’t wait to get out in the work place. I am ready to paint the town RED. SNAP! 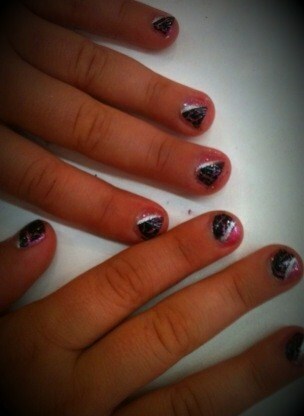 For this design I used OPI Axxium gel, black China Glaze crackle polish and LCN. Nail biters are a thing of the past. 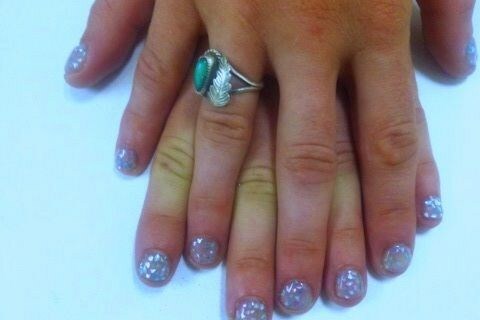 After using Axxium OPI gel overlay with dyed shells on her nails, this client decided to stop biting her nails!